Kitchens are often the heart of the home; however, not everyone has the luxury of a vast space to create their culinary delights and feed their friends and family. 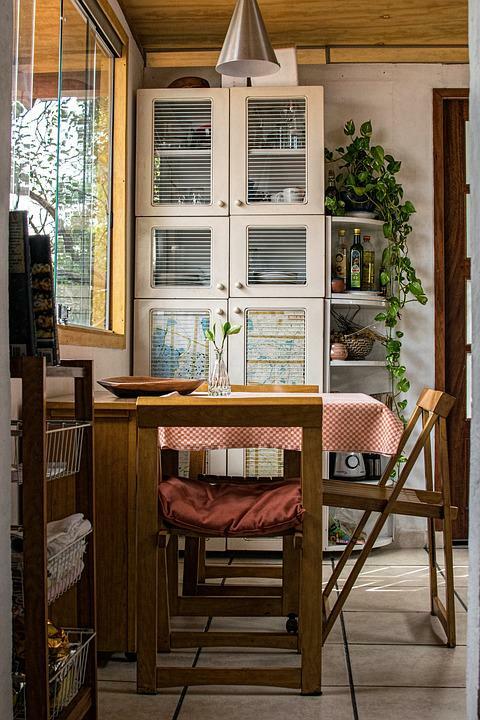 For many, especially apartment dwellers, the kitchen is a small space, yet still an important part of the home and an integral part of everyday life. The following are some tips and tricks to make the most of your kitchen capacity and help it reach its full potential. A lot of kitchens have to double-up as dining areas, meaning that furniture like tables and chairs have to reside in there. Therefore; having enough room to move around and cook your meals can be made awkward when there are large pieces of furniture blocking the way, so finding ways to maximize the space is important. Furniture that can be partially, or fully folded and put away is the perfect solution for those who don’t own a banqueting hall, and fortunately, there are plenty of options to choose from. Table tops can be partially folded down when they’re not in use, so you can skim past with ease when baking something tasty. Pieces that are perfect for folding or stacking away are stools and chairs; they can even be made a feature on the wall, and familiar guests will know to come in and grab their seat off the wall when it’s time to eat. For inspiration on foldable furniture ideas, have a look here. If your kitchen countertops are cluttered; it’s going to make your small space seem even smaller, so it’s time to see how you can free up some room. Shelves and drawers are successful ways to organize smaller items; like food, utensils, and jars. Your shelves can become decorative areas where you display your favorite cookbooks and tableware; they will also become more accessible when out on display, making activities in your kitchen straightforward and easy. Cupboard space can be essential for storing larger electrical items that you don’t reach for every day, like mixers (unless you bake cakes for a living); meaning there’ll be room for the toaster that you use every breakfast time. There are always alternatives for everyday appliances to live; so maybe it’s time to start thinking about the best over range microwave for your kitchen, or asking yourself if you still really need that fancy espresso machine you bought because it was on sale, but have only ever used twice (it could make a great housewarming gift for someone). Deep, dark colors are beautiful; however, they can often draw a space inwards, making it seem smaller; so maybe black walls and cupboards aren’t the best choice for your home. Bright colors are a great way to create a feature wall or draw the eye to a particular area of the room, but again, be wary; as too much can be overpowering and create a bit of claustrophobia within a room. Light shades and neutral hues are a dependable way to open up your kitchen space and do not have to be a predictable or boring choice. A neutral palette will allow features like those shelves and fold-away chairs, discussed earlier, to shine through, without taking anything away from your limited cooking zone. A smaller space is simply the chance for you to be creative with your interior choices, and might just end up in a design feature that you and your visitors will love.